Hello all, I've recently started running my car and Auto X with the young engineer as a driver he and his friends are very enthusiastic about this class and are talking about building a new car using their formula SAE experience so maybe some new blood here…. I have some questions about chassis set up as this car was formally ran in road race car. I'm running a 1600 cc engine with a single carb at this point and a ball joint front end with disk brakes all around. The tires are American Racer 20/6.0 13S on front and 22/7.5 13S rears. The front and seems to be sticking very well but the rear is very loose with a lot of oversteer (had a few spin outs but kept it running.. ). The track is asphalt, fairly smooth but kind of old and decomposing a bit. Sorry, not a lot of people are watching this site - many have gone over to Apex Speed. We need to keep this forum active for various reasons. I may be missing it, but are you running a zero roll or a Z bar car? If a Z bar, with the driver in the car and rear camber set, the bar should rattle around, no preload either way to start. I know autocross is different than road racing, but I would start with 1/16" toe IN total to 1/8" to start with. For the front you can use toe OUT to get the car to turn in if needed. I will try to help but give a few days for an answer. Yes I do go on Apex quite a bit but like this site too, hope it keeps rolling along. We did run the car again on the 12th. of March and I went ahead and put in more rear neg. camber, about double to around -2deg. And that did the trick on the oversteering. But good to know I can add a little more. It is a zero roll car. We made 8 runs and the tire temps were still fairly even somtimes 3-5 deg warmer on the inner edge. I also noticed that as the day progressed the tire temp were about the same as the track temp. So not sure if I'm getting any usefull data from the temps. The tires surface looked good with mild scrubbing evenly across the surface. All in all we were very happy as we went from being 6 seconds behind the fast Lotus to only 5 sec this weekend. I have about 0.8 deg of toe-in in the rear. I used a couple of long straight edges on jack stands alining off the wheel rim at a hight of wheel center lines to measure rear toe (after checking that I didn't have a bent rims). Is there a better way? How does rear toe-in affect the handeling. Good to know about the toe out in the front. I suppose that having the front a little darty wouldn't matter in autocross. Sorry, I only check this every few days also. If you have a zero roll car, besides the static negative camber, you have a droop stop. The sudden oversteer could have been the car coming up on the droop stop. when you jack the car up in the air, the droop stop should hold the camber to negative about -1 to -2 degrees. The amount is not as critical as coming up against the stop is. By going more negative, you reduce the chance of getting into the stop. On an autocross, you make a lot of quick transitions which could cause the car to jack. Not sure what tires you are running but at some point you go too negative and then you start having oversteer again. But if you are around -5 degrees total and -2 total in droop, then it should be runnable. You can also look for a softer stop rubber. Your method of checking toe is okay, I use a similar method myself. The tried and true method is to jack the car up in the air so the tire is just off the ground and scribe a line around the middle of the tire. This video https://www.youtube.com/watch?v=0ziovI1651o shows how he runs a loop of tape around the tire and marks it with a pen (not shown). 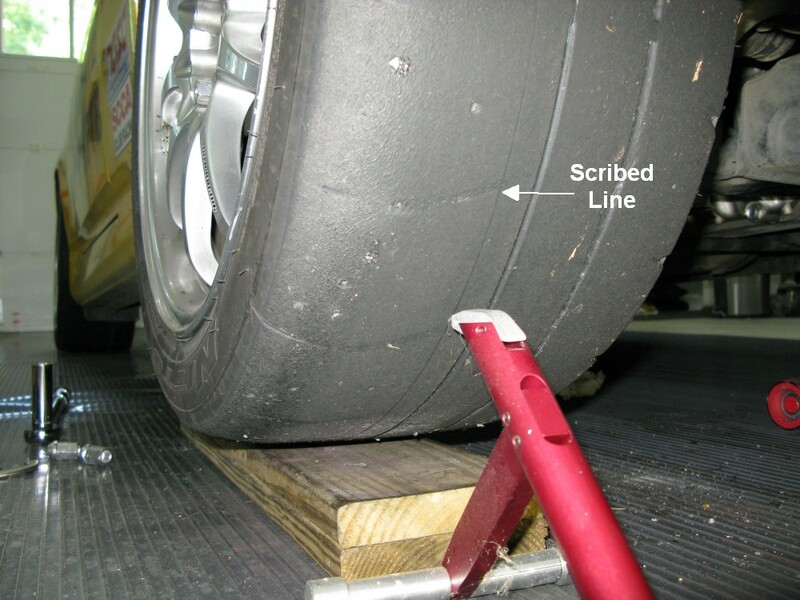 I will not vouch for the rest of the video, but you can do an alignment with string (I use heavy fishing line) If you want a professional tire scriber it looks like this http://www.longacreracing.com/products. ... ire+Scribe but I have used a sharpened screwdriver and a block of wood to hold the angle. Using your method, I would just make two marks on your straight edges, matching the diameter of your tires. the difference is your toe. If you measure 58" and 57 15/16" - then you have 1/16 total toe. You have to use some common sense to decide if it is toe in or toe out depending which measurement is where. If my car was not apart I would do a video - I will have to add this to my list. I don't know how you are measuring your .8 degrees so I cannot tell if it is a lot or not. More toe in in the rear gives stability, but on an autocross you need just enough to make the car comfortable to the driver. Good luck with your next event and let us know how you do. These are great links, I've been studying them and others. I like the idea of scribing the tire to set the toe as it reduces the introduction of error from wheel run out. Also with my straight edge method I was measuring to the frame on one side, then under the frame and then to the other straight edge because obviously the frame is in the way but now essentially I've added up 3 measurements instead of one. Now I've made a Trammel bar to go under the frame and go to the tire scribe marks. Unfortunately I don't think we'll be able to make it to the event this weekend and the car is still on jackstands but I'll post some pictures of my toe alignment set up when I next have it on the ground. The car has 13" American Racer tires on it, i'm not sure of the compound there is a number (133) stamped in the side walls.